Randall Leo Jones (born January 12, 1950), nicknamed "Junkman", is an American former professional baseball left-handed pitcher. He pitched in Major League Baseball for the San Diego Padres and New York Mets. Jones won the Cy Young Award in 1976. He attended Brea-Olinda High School in Brea, California. He attended Chapman University in Orange, California. He was known for his sinker and the large number of ground-ball outs he induced. 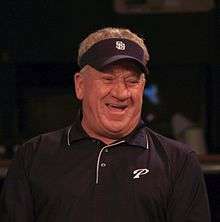 Jones was drafted by the San Diego Padres in the fifth round of the 1972 Major League Baseball draft. He made his major league debut on June 16, 1973. In 1974, Jones went 8-22 with a 4.45 ERA. He was able to turn it around in 1975 when he won 20 games and led the National League with a 2.24 ERA earning The Sporting News Comeback Player of the Year Award honors. His best season was in 1976, when he went 22-14 with a 2.74 ERA, winning the National League Cy Young Award and being named The Sporting News NL Pitcher of the Year. He was selected as the left-handed pitcher on The Sporting News NL All-Star Teams after the 1975 and 1976 seasons. Jones established the Major League season record for most chances accepted by a pitcher without an error (112 in 1976), tied ML pitchers records for highest season fielding percentage (1.000, 1976) and most assists in an inning (3, 9/28/75 – 3rd inning), and tied the NL pitchers season record for the most double plays with 12 in 1976. Jones owns the distinction of recording a save for the NL in the 1975 All Star game and being the starting and winning pitcher the next year. He entered the 1976 All-Star Game with a record of 16-3, an All Star break win total that no one has equaled since. During his last start of the 1976 season, he injured a nerve in his pitching arm that required exploratory surgery, and he was never quite able to regain his Cy Young form. Jones pitched effectively for San Diego through the 1980 season. On December 15, 1980, he was traded to the New York Mets for José Moreno and John Pacella. After the 1982 season, Jones was released by the Mets and signed with the Pittsburgh Pirates. He was released by the Pirates before the 1983 season started, thus ending his playing career. His career win-loss record was just 100-123; he remains the only starting pitcher to win a Cy Young Award but retire with a losing record. He was named an All-Star in 1975 and 1976. After his retirement, Jones' uniform No. 35 was retired by the Padres on May 9, 1997. After retiring from Major League Baseball, Jones has coached young pitchers. His most prominent pupil was Barry Zito, a former Major League pitcher and the 2002 Cy Young Award winner while with the Oakland Athletics. He also is the owner of Randy Jones All American Grill, Randy Jones Big Stone Lodge, the home of his catering business Randy Jones Buckboard Catering. The Big Stone Lodge sells a barbecue sauce that bears Jones' name. Jones also is involved in the San Diego Padres local radio broadcast pregame and postgame show. In 1996, Jones was inducted by the San Diego Hall of Champions into the Breitbard Hall of Fame honoring San Diego's finest athletes both on and off the playing surface. He was inducted as part of the inaugural class of the San Diego Padres Hall of Fame in 1999. Jones can be heard live, every Tuesday at 1:00-2:00 (PST) on wsRadio.com. "Randy Jones on Baseball" covers everything baseball from his Hall of Fame/Legendary guests, to the latest news and an inside look at the Major League Season. ↑ Walton, Ed. "The Ballplayers – Randy Jones". BaseballLibrary.com. Retrieved 2009-09-07. ↑ "Randy Jones from the Chronology". BaseballLibrary.com. Retrieved 2009-09-07. ↑ Kepner, Tyler (November 8, 2002). "BASEBALL; Zito Beats Martínez to Win First Cy Young Award". The New York Times. Retrieved May 22, 2010. ↑ "Randy Jones BBQ Sauce". randyjonesbbq.com. Retrieved November 3, 2014.